DXSpotter is designed as an efficient, stable and easy-to-use program for the exchange of information for HAM radio users. DXSpotter is capable of exchanging a tremendous amount of information in DX Clusters on the Internet and working with the popular DXSummit service. DXSpotter has a fully adjustable interface, including graphical skins, and satisfies the needs of any user. When connecting to cluster, there is the option of automatic authentication and saving of the password. DXSpotter has the added ability to notify the user of selected DX stations, allowing the user to use the program in the background. The user is able to set unique sounds, turn on 'speech' mode, or enable the popup alert to notify when a chosen DX station, announcement or WWW information has appeared. Filtering the frequency gives the ability to view only those stations within the selected range. The search utility for popular callbooks (QRZ, HamCall and RAC), and online search utility give the possibility of quickly retrieving information about working stations. If the user participates in a contest or is a hunter for DX, then the option of quickly setting the transceiver to a frequency for a working station, gives another advantage. The current version of DXSpotter supports more than 70 popular models of transceivers from YEASU, KENWOOD, ICOM and Ten-Tec. The integration with other HAM radio programs gives the ability to view working stations on a map, with the help of programs like DXAtlas, and provides an easy way to quickly transfer the information to the logbook. A full log of the program, lists of the DX spots and announcements can easily be saved for future reference and use, with the additional ability of sorting them 'offline'. One other ability of DXSpotter is a utility allowing for the synchronization of the computer's time with increased accuracy, allowing the user to avoid differences while sending messages. An automatic mode or server access without connection scripts. Full log reports, saving of DX spots, WWV and DX announcements, with further viewing available in Offline mode. Easily configured DX spot, WWV and DX announcements filters. User-friendly interface of received information with full color adjustment. Changing the screen size to match the Spot-table. Sending DX spots and announces to clusters around the world. DX Spots real time spelling. DX sound and popup alerts for DX stations or information you need. Search for text or callsigns. Advanced Internet search for DX stations. The BandMap utility for monitoring bands in real time. One click for HamCall, RAC or QRZ Callbook information. One click for DXCC or IOTA information. Hyperlinks for DX station and frequency. The autocomplete of useful cluster commands. Multiple copies may run simultaneously for monitoring an unlimited number of different DX Clusters. The DX Tray utility for quick launch DXSpotter and utilities. Special Net Traffic utility for DXSpotter's traffic counting only. DXAtlas software and broad list of Logbooks integration. Quick Jump to the DX frequency. DXSpotter supports more than 70 TRX models from ICOM, KENWOOD, YAESU, Ten-Tec. The DX Summit window monitors the DX spots and announcements available on the Internet at DX Summit web site and presents the information in a sortable grid format. With a single click the ability to retrieve 25, 250, 1000 DX spots, announcements, WCY, and WWV reports. Automatically retrieve latest DX spots. Send DX spots, announcements and WWV reports to DX Summit WEB site. 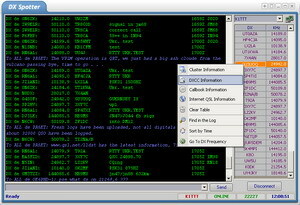 HamCall, RAC or QRZ Callbook search. Extended DXCC and IOTA information. Advanced Internet National callbooks search. Sort DX spots by Frequency, Time, Callsign, Spotter or comment. Easy URLs for monitoring IOTA, QRP or other special links. Marking of the latest DX Spots. Multiple copies may run simultaneously for monitoring different lists from DX Summit WEB site. Added support for new TRX models from Kenwood, ICOM and Yaesu. Implemented custom links for DXSummit. Added ability to change visual styles for common controls. Added modern flat icons (can be selected from options). Updated Options dialog with extended settings. Added support for high-resolutions in Windows 10. DXSpotter is not free software. Unregistered copies of DXSpotter are fully functional (except TRX control), but will run for 10 minutes per session only (or 20 lookups per day for DX Summit). You can download and use DXSpotter free of charge for a period of 30 days. After that period you have to either uninstall the software or register your copy of the DXSpotter by sending an equivalent of 25 US Dollars. Registering DXSpotter will help to ensure that development of the program continues. Once registered, you'll get a lifetime unlimited free access to any future release of current version, without having to register again.